"Take your worst case estimate, double it and use that as your best case estimate." This puts it mildly, but humans are for the most part really bad at estimating effort. Threema’s private chat feature is worse than useless and desperately needs plausible deniability. The hidden chat feature must be implemented in a way that allows the user to plausibly deny that the a private chat actually exists, up to the point to unlock the application and “prove” it. Threema uses the same passcode to unlock the application user interface and to show private chats. The problem here is that this only one security token, that once revealed basically renders the remaining safeguards null. The “Show Private Chats” divulges the current state of the application. First this user interface element is only visible when there are private chats. This leaks the information that there is more to get. 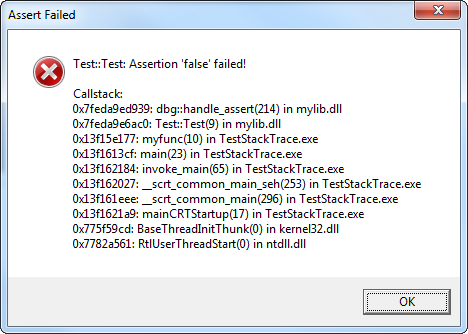 Getting a stack trace from a C++ executable under Windows is not trivial. The key problem is, that in C++ there is no simple stack_trace function and the Windows API only provides StackWalk, not some handy function like glibc's backtrace function. ©2009 - 2018 Sean "rioki" Farrell | Imprint | This blog is the personal opinion of Sean "rioki" Farrell and does not constitute an opinion or position by my employer.